Yamaha has always been a leader in the field of trail bikes. Following its first model of this kind, the 250 DT1 of 1970, the XT 500 unleashed an amazing craze, and the successive versions of the DT 125 broke many sales records over the years. Bit by bit, the original DT concept benefitted from the lessons learned in competition and - from the stylistic point of view as well as the engineering aspect - became more and more inspired by motocross models. 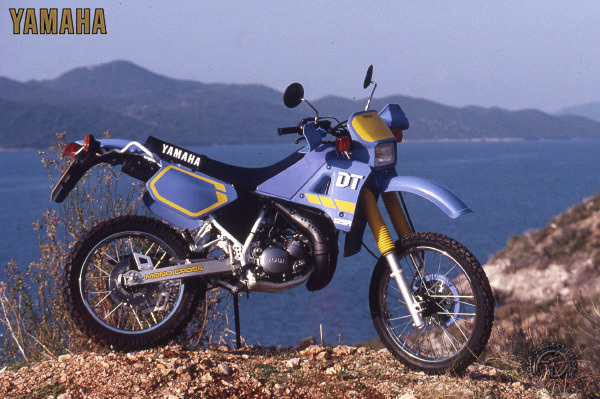 Yamaha rider Van de Berk dominated 125cc motocross in 1987, and new heights were reached with this 125 DTR. Its engine, derived from the road-going TZR, is a compact unit-constructed two-stroke with liquid cooling. The unusual feature was the automatic intake valves mounted directly on the crankcase. The carburetor benefits from a YEIS intake control system and - as a supreme refinement- the DTR is fitted with a rotary valve on the exhaust. This permits a genuine improvement in performance by matching the exhaust timing to the engine regime. This system will be seen more often on all the modern high-performance two-strokes. The technologically-minded were delighted; off-roaders were ecstatic, for the DTR also represented real progress in handling. Its classic frame has generous suspension travel, a Monocross layout with bellcranks at the rear and a single damper and a front fork with massive 1.6 inch tubes. With its generous suspension tmvel, the little 125 DTR benefits from the hard-won lessons of competitive use.